Chiang Rai was for centuries captured and recaptured by Burma and Thailand. Now sitting at the Northern most tip of Thailand, this beautiful area is a testament to its incredible past. Go to see where the most revered Buddha statue was unearthed. The Emerald Buddha was only discovered after an earthquake split a mound of clay in two, revealing the treasure within. Some even say that the statue was buried in this clay to stop marauders from pillaging it during one of the city's many sieges. Additionally, Chiang Rai province is littered with traditional mountain villages which are great to visit for some rural culture, or just to cool down! We’ve selected the best places to stay in Chiang Rai to take in all the city has to offer. Wat Phra Kaeo (Temple of the Emerald Buddha) - Although the actual Emerald Buddha now resides in Bangkok's Wat Phra Kaeo, this temple is still a must see. Spectacular architecture and a fascinating glimpse into the Chiang Rai's culture. It’s also just downtown! Doi Mae Salong - This mountain village has a primarily Chinese community and offers a variety of activities, from a tour to General Tuan’s Tomb to tea tasting. A great way to feel a cool breeze in a stunning setting! Tad Kwan Village Park & Waterfall - Visit this unspoiled village to learn about the ancient Mien tribes, or just cool off in the waterfall. It’s also possible to rent a buggy so getting around is easy. The best places to stay in Chang Rai can get booked out quickly, especially during the peak season so if you are planning a stay we recommend booking well in advance. Anantara Golden Triangle is an extravagant and luxurious resort in a rural setting. 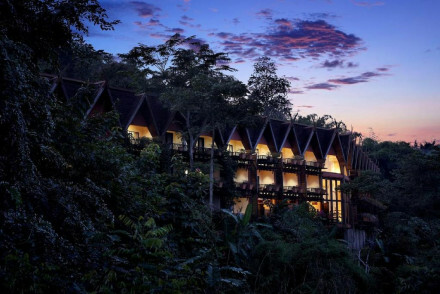 Spectacular views, a renowned spa and bordering a magnificent elephant resort. 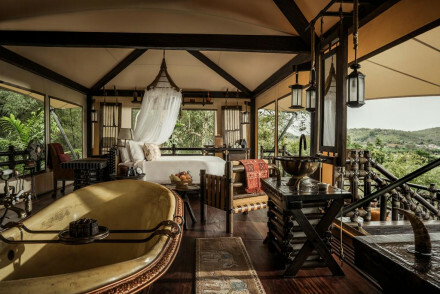 For serene luxury, and spectacular views in a hideaway jungle location, book the Four Seasons Tented Camp. Explore mountain trails, interact with rescued elephants, then head back to your gorgeous accommodation for sundowners and gourmet dinners. For the warmest and driest time to visit, aim to visit between November and March. The rest of the year will only be slightly cooler but there will be a much greater chance of rain. Fly into Mae Fah Luang-Chiang Rai International Airport, located 8km outside the centre of town, before taking the bus or a taxi in. Alternatively, consider hiring a car with Rentalcars. Browse our list of the best places to stay in Chiang Rai. Widen the net to include our recommendations in Chiang Mai or Kanchanaburi.